Following Toyota's romantic RAV4 silhouette teaser shot yesterday, Subaru is officially joining in the compact crossover titillating game with a glimpse of the 2019 Forester. Subaru has toyed with pincer-shaped taillights for a few years on its Viziv concepts. The Ascent concept wore another version of the design, but the production Ascent got fitted with a set of highly unoffensive lamps. Looks like the Forester earns the retail nod for the conceptual units, and with it, a wider cargo opening. The taillights on the present Forester impose a scalloped shutline on the tailgate. The split units in this teaser let designers push the tailgate edge just a few inches from the edge of the car. The Ascent could make its presence felt elsewhere, though. We've made out a couple of the flowing character lines underneath camouflage on Forester prototypes that match the Ascent's flanks. Up front, the 2019 Forester gets a much more upright schnozz reminiscsent of the Ascent. The two vehicles differ in grille treatment — the Forester carries over its general design from the current car, but replaces the thick geometric bars with thin strakes similar to the Ascent's. Although larger than the current Forester, we don't expect huge growth anywhere. 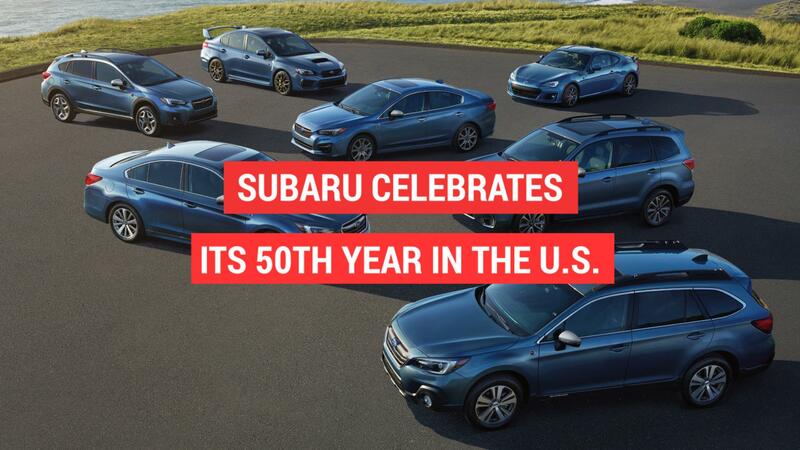 Migrating to Subaru's Global Platform will make the most of the incremental gains; the much smaller Impreza added three additional cubic feet of cargo room after its switch to the SGP. We don't know if engines will be included in the under-the-skin overhaul, but a welcome swap would be adding the Ascsent's 2.4-liter turbo to the lineup. That lump produces 260 horsepower and 277 pound-feet of torque, trumping the 250 hp and 258 lb-ft in the current top-tier Forester 2.0XT Premium. Spy photographers caught the Forester testing alongside a new Honda CR-V and a Volkswagen Tiguan, which means we could be in for a new level of feature and dynamic polish. What we can rely on is a selection of four-cylinder boxer engines and CVTs, plus updated EyeSight driver assistance tech. The debut happens in exactly two weeks at the New York Auto Show, the showroom appearance late this year.